Suzuki Motor India Pvt Ltd showcased the GSX S750 at the Auto Expo 2018. The upcoming middleweight streetnaked should help the bikemaker establish a stronger foothold in the mid-capacity performance motorcycle segment. The GSX S750 will come to us via CKD route. It will challenge the likes of Honda CBF650 and Kawasaki Z900. The launch of the GSX S750 will happen very soon. There are many rumours that this motorcycle can be launched as early as the end of this month! The GSX S750 is likely to be priced around Rs 7.5 lakh. Powering the motorcycle is a 749-cc, liquid-cooled, 4-cylinder DOHC motor that produces a maximum power of 114 PS at 10,500 rpm along with a peak torque of 81 Nm at 9000 rpm. The engine will come mated to a 6-speed transmission. The motorcycle will tip the scales at 211 KGs. It will offer three riding modes. Other features include bits like a full-digital instrument panel, 310 mm twin petal disc brakes at the front, a single disc at the rear, and ABS. The GSX S750 gets stylish multi-spoke alloy wheels shod with 120mm- and 180mm-spec rubber at front and rear. The motorcycle will offer two color options – Metallic Triton Blue/Glass Sparkle Black and Pearl Mira Red. The Honda CBF650F and the Kawasaki Z900, the two main rivals of the upcoming Suzuki GSX S750, are currently priced at Rs 7.68 lakh and Rs 7.30 lakh respectively. Other than these two, the GSX S750 will also rival the likes of Ducati Monster, Triumph Street Triple, and Kawasaki Z900, along with Yamaha MT-09. 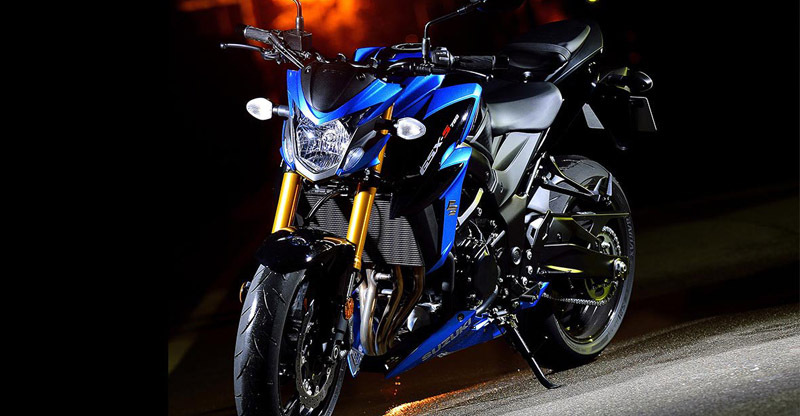 Apart from this middle-weight streetnaked, Suzuki Motor India Pvt Ltd is also rumored to be working on a new 250-cc variant of the Gixxer motorcycle. If that’s true, the Gixxer 250 will become a direct rival to the Yamaha FZ25. It’s noteworthy that the Gixxer 155 has been pretty successful with establishing itself in the market. A 250-cc model, in all probability, will benefit from Gixxer’s high brand image.